Angels are the messengers of heaven and they are revered for their purity, kindness and faith. They symbolize a special meaning wherever they are used, in pictures, paintings and tattoos. 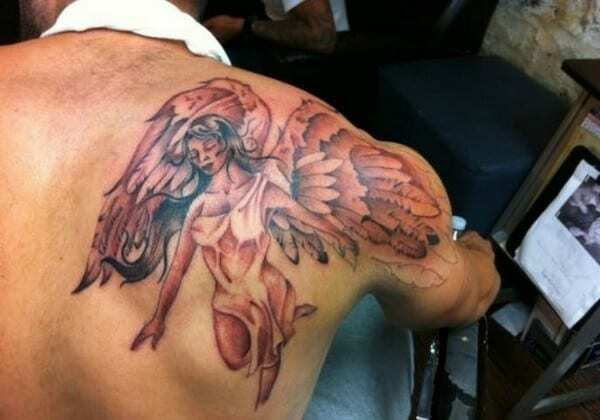 Angel tattoos have been one of the most favored tattoo designs since the origination of this form of body art, with both men and women having these designs featured on their bodies. The fact is that they are not only revered for their beauty but also for their symbolic meaning as they stand for one’s faith and belief in God, as angels have always been directly linked with the Heavenly father. Angel art, being delicate to look at, are considered feminine, but they are equally liked by males too. 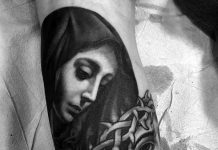 The most popular places to bear these tattoos are the back and the shoulder, neck, wrist, thigh, ankles and arms, depending upon the liking of the bearer and the size of the design of the tattoo. They are undeniably one of those extremely unique tattoos that you can wear on your body. Not only that, since these tattoos are also very attractive and will give you the extra gorgeousness that you are aiming for your physical appearance. 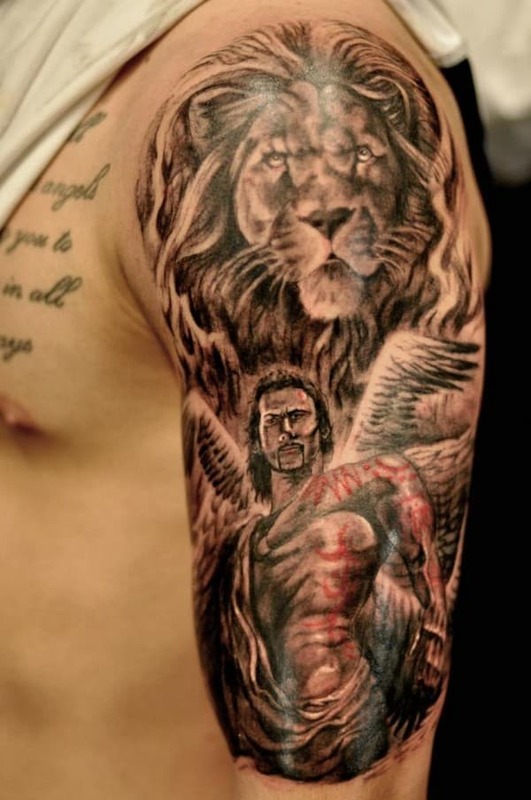 Yes, if you have these tattoos, there is no way you will not look great in the eyes of many people around you. 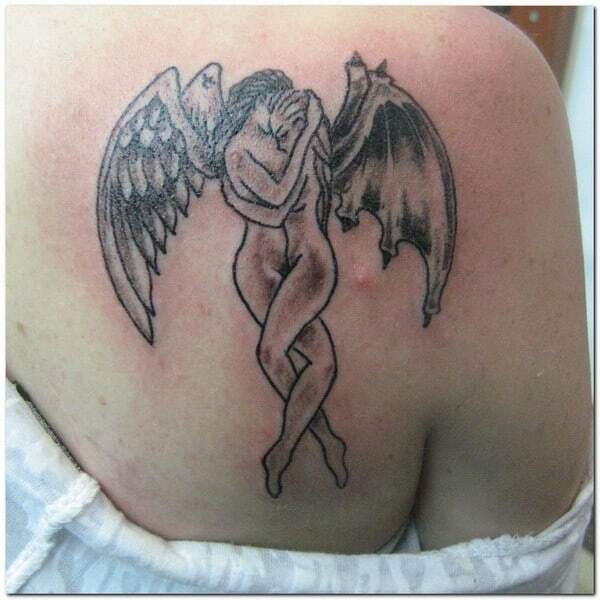 Because of its extreme uniqueness, thousands of women and men tattoo lovers are choosing an angel art tattoo. 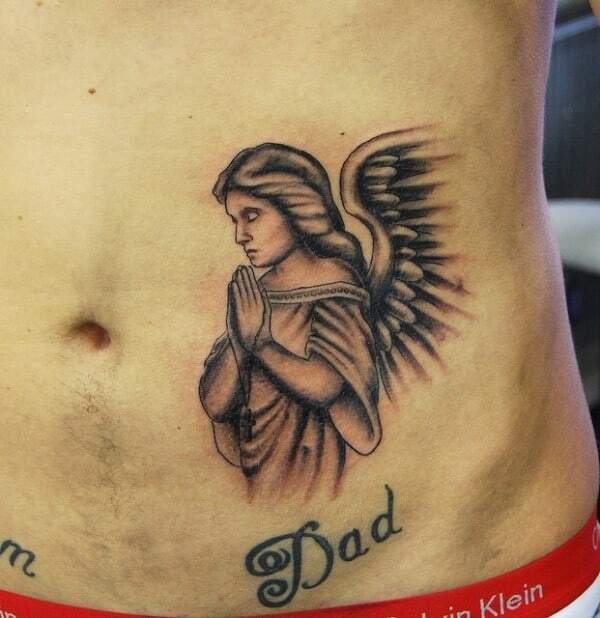 People are engraving an angel art tattoo on their body due to a number of reasons. 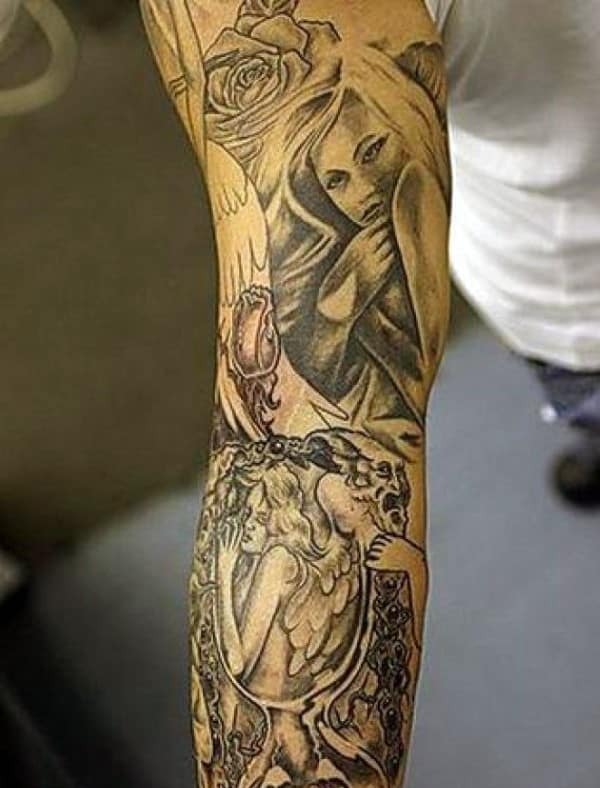 There are those individuals who are relating their unique personality to these tattoos. There are those who relate the tattoos on their religion, while there are also those who are simply wearing these tattoos for beautification purposes. But whatever your reason may be of having these tattoos, the information in this article will surely enrich your mind. Christianism – For your own information, angel is a very sacred creature in the world of Christianism. It is a beautiful innocent creature that is floating in the heaven, who is known to be the Divine’s loyal flower. Christian people believe that everyone of us has our own guardian angel. Beauty – Since angels are known to be very good people who are not capable of doing some wrong things, it is no longer surprising why an angel art is symbolizing beauty. Protection – Angels are known to be the guardians of everything that is created by God in this world. 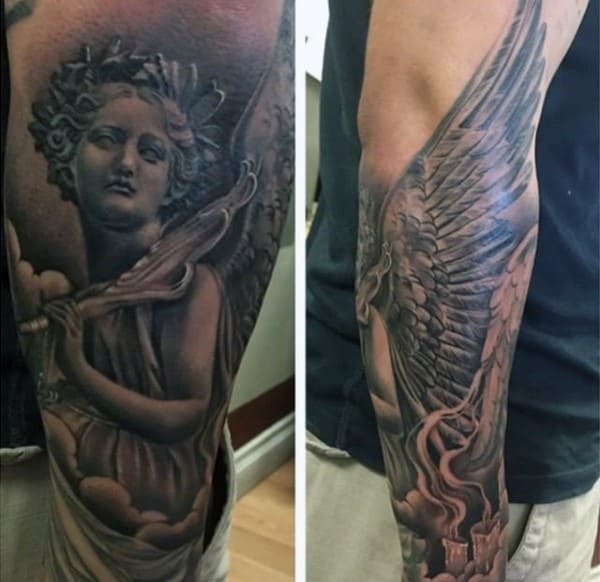 Hence, if you strongly believe that you have a guardian angel that is always there to protect you from bad things, then wearing an angel art tattoo is perfect for you. 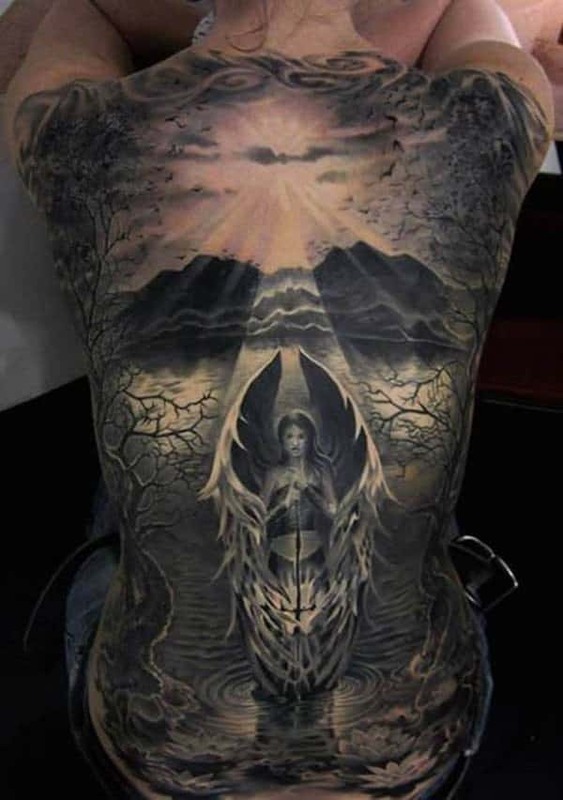 Angel Art on Rib –The number one body part that you can place is your rib. You can have it in both of your left and right sides. There is no way it will not look great on that placement. 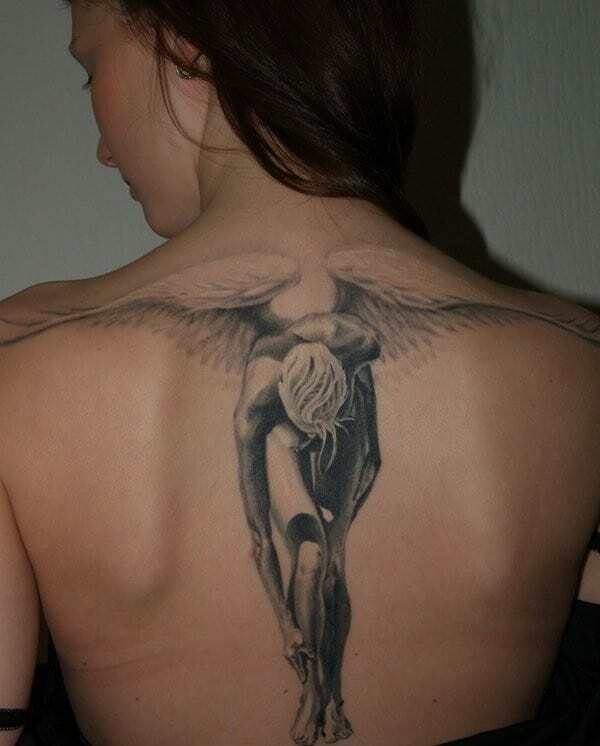 Angel Art on Back –If you want to be out of ordinary, you can place right there at the back or lower back. 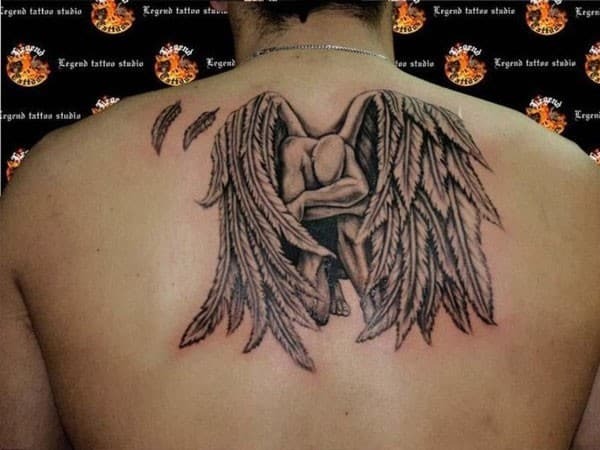 The fact that people would still go towards your back in order to see this tattoo really makes it more interesting. Angel Art on Back of Your Ears –Another very unique yet worth considering placement is at the back of your ears. People will surely get very interested to know you if you have such tattoo at the back of your ears. Of course, it can also make you more gorgeous. Angel art on Feet –Yes, it would also look great right there on your left or right foot. 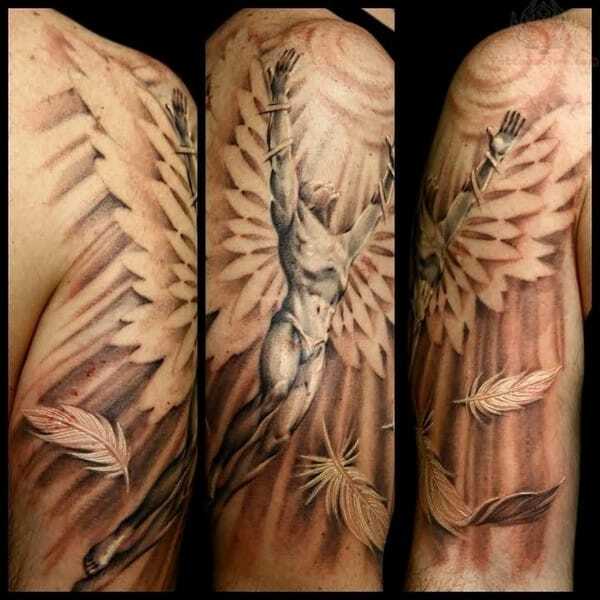 In fact a lot of ordinary people and celebrities are having a angel art on this particular body placement. 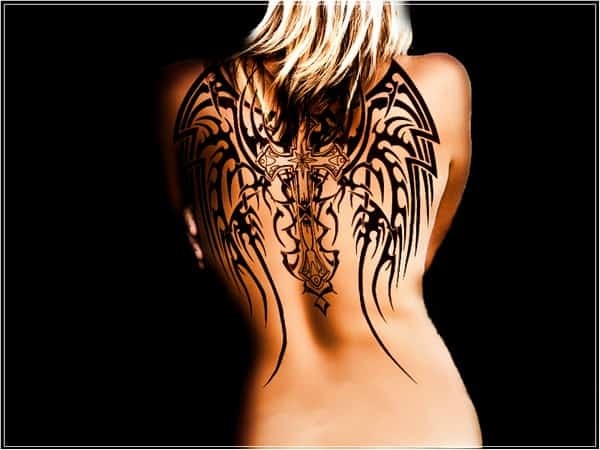 Angel of Death Tattoo Design – An image of an Angel of Death is a very popular design that many people are considering to have. For you to know, an Angel of Death is known to be the dark angel who is responsible of carrying the souls of the deceased people towards the heaven for them to continue their lives right after death. 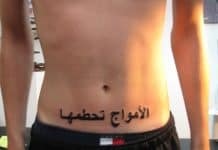 This design has the purpose of untimely death protection, illness protection, and pain protection. Archangel Design – Another gorgeous design is regarded by a number of people worldwide is the Archangel design. Why is it so? Well, it is simply because Archangel is said to be the one who has a strongest connection to the Divine among the angels. Hence, it is no longer surprising why it is symbolizing reverence. 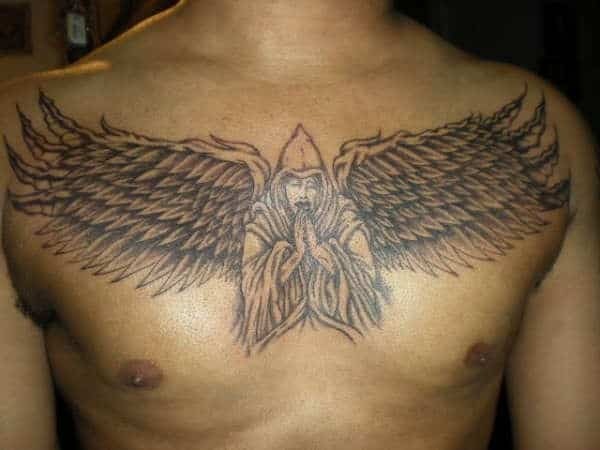 Angel Wings Tattoo Design – In case you only want a smaller angel art that you don’t want to engrave the whole image of an angel on your body, then you can opt for angel wings tattoo design. You can choose to have the two wings or only a single wing. It is now depend on your personal preference. You can then incorporate some other sub designs that you like. 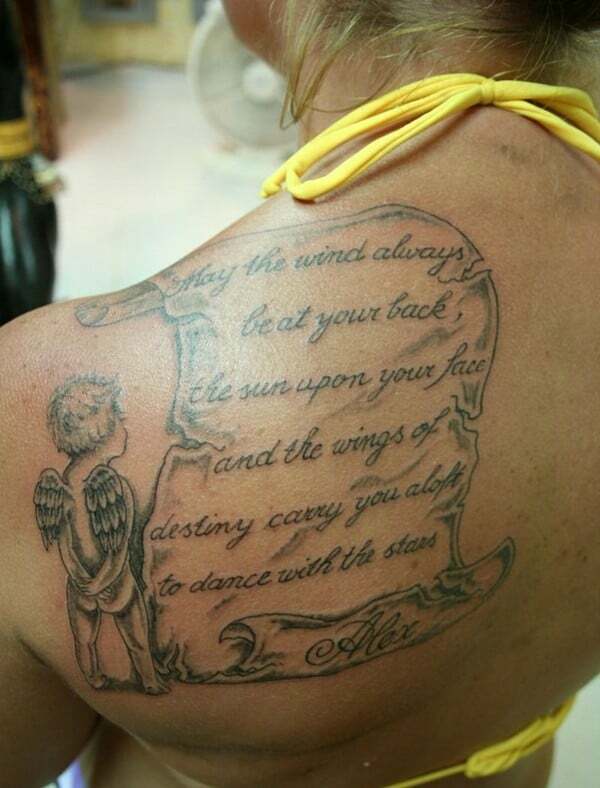 It is best to place this tattoo right there on your back as if it is your own wings. Isn’t that very amazing to imagine? Cherub Tattoo Design – Just in case you do not know, Cherub is a baby angel who is floating in the clouds. He is naked that has beautiful white wings. He is actually the one being called as Cupid. With that being said, it is no longer surprising why a Cherub tattoo is considered to be symbolizing love. 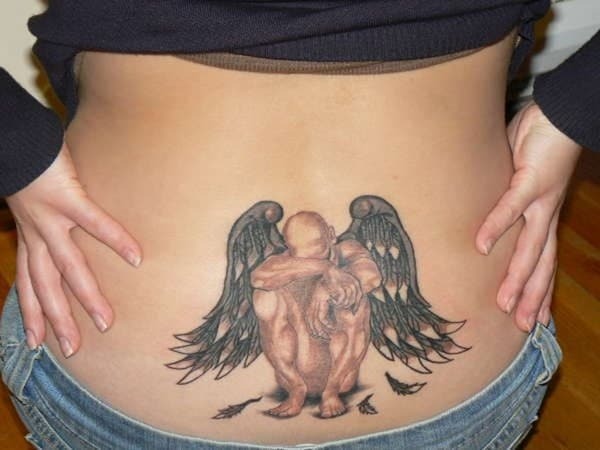 In case you are a very loving person, then having a Cherub tattoo design is something that you can do. 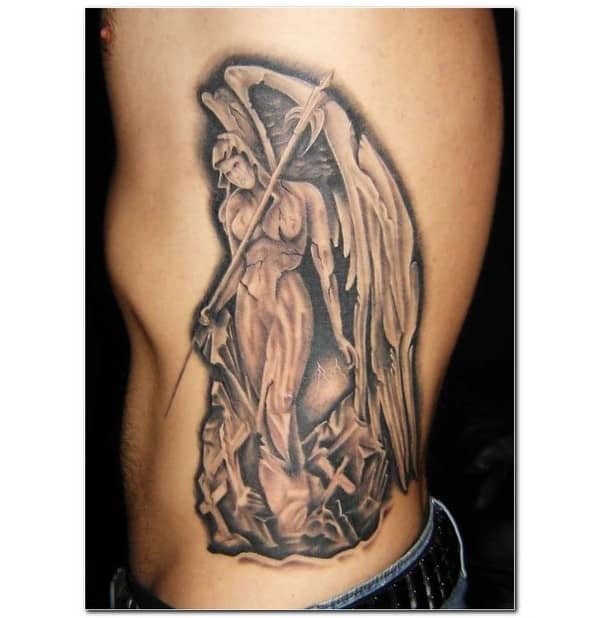 Fallen Angel Design – The fallen angel art design is one of those very interesting ones when it comes to angel art tattoos. This has a very interesting story to tell to the other people around you. Fallen angels are known to be those dark angels who are falling from the heaven because they have done something sinful that made the Divine angry, punishing them from these wrong doings. 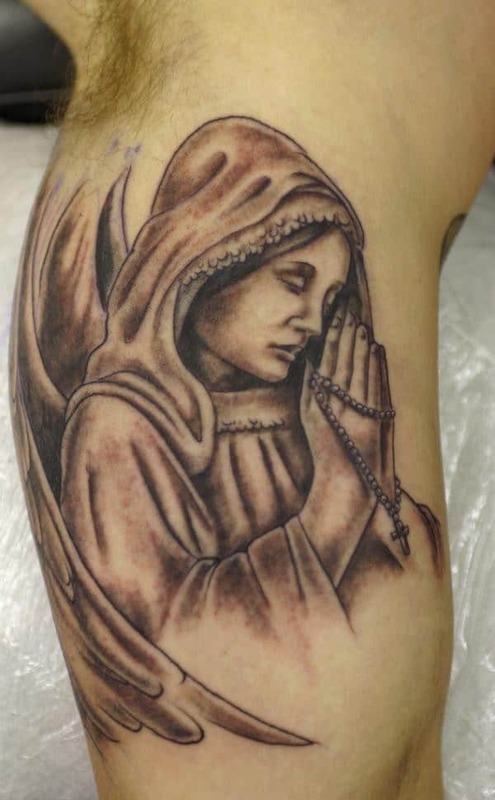 If you are too brave enough to accept all your sins in life, then having this design as your body tattoo would certainly be perfect. Angels have been defined as the messengers of God in different religions. The Christian religion links these divine beings with Heaven and they are pictured as beautiful and innocent beings floating around in the clouds, playing soft music on harps. Similarly, they are shown as heavenly beings in Catholic, Jewish and Islamic religions too. As per the religious texts of the Bible and the Koran, angels are believed to carry the word of God to men and to serve and protect the human race by carrying out the orders of the Divine. They fight against the evil forces prevalent on the earth and also count all the good and bad deeds done by all the human beings, for which they would be answerable at the end of their lives. 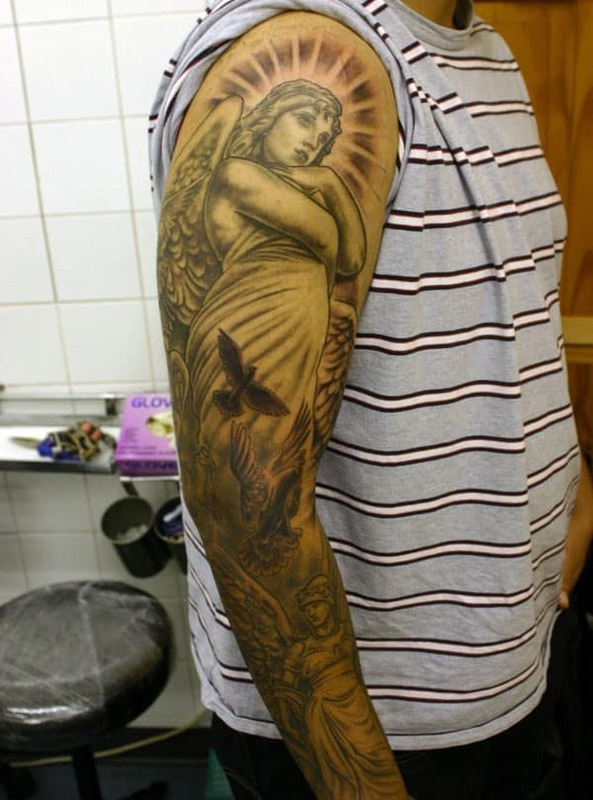 As angels are associated with God and His will, angel art tattoos too have a deeper divine symbolism. These tattoos signify beauty, purity, peace, love, innocence, devotion and protection. They also stand for faith and closeness to the Divine. There is a common belief that angels protect humans, as it is often talked about the “Guardian Angel”, which associates the angel done in memory of a loved one who is no more, but will always remain with the bearer and protect him further in his life. 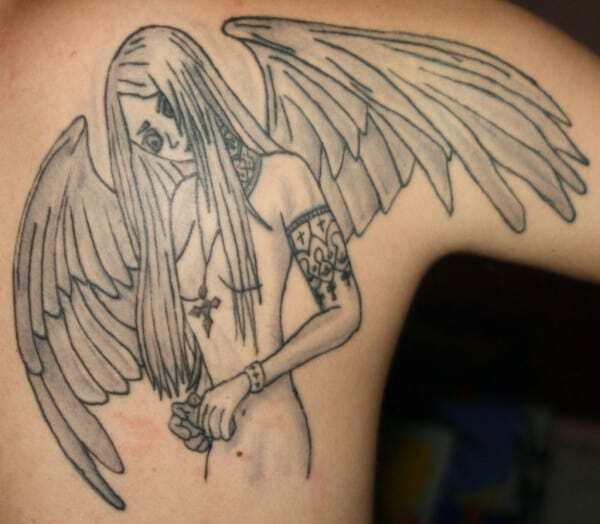 It is believed that wearing an angel tattoo can thus protect one from dangers of accident, disease of physical damage, besides shielding the bearer from all kinds of negative forces. Wearing them is an expression of one’s belief and faith in God, which is said to bring positive influence in one’s life. 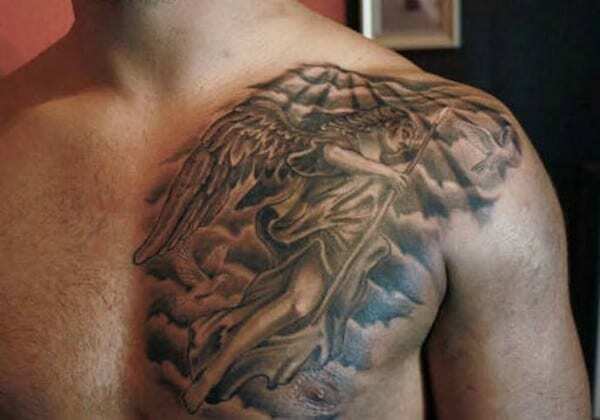 Archangel Tattoo – This is one of the most revered designs among angel art tattoos because Archangels are those angels who are regarded to be closest to the Divine. While St Michael, who is the warrior of God, is considered as the most popular archangel, another one is Lucifer, the fallen angel who became Satan. 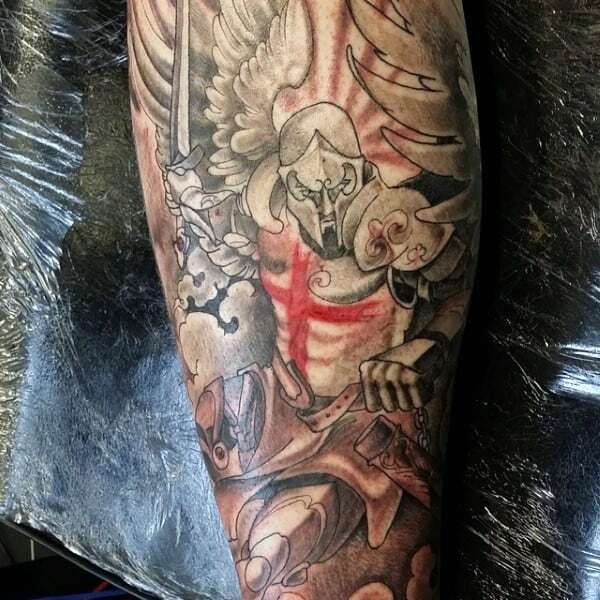 This tattoo showing the battle between the two of these archangels is a well liked tattoo design by discerning tattoo lovers. Cherub Tattoo – A cherub angel refers to a baby angel, who is pictured as a small naked child with wings, floating within clouds. The cherub tattoos are linked with love as cherubs are considered to harbinger love, as Cupid, who is believed to make people fall in love, is a cherub. 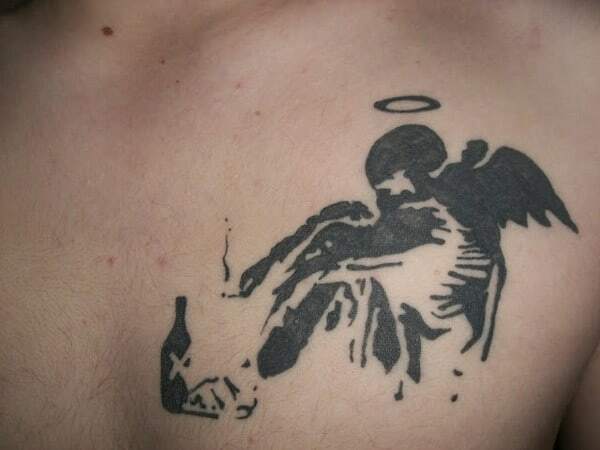 Others believe cherubs to be attendants of God and bearing this kind of tattoo shows one’s devotion to Him. Angel of Death Tattoo – Angel of Death is a dark angel, who carried the souls of the deceased to the heaven to continue their afterlife. Also, this angel is known to provide protection from pain and illness and also untimely death. The angel of death tattoo is borne by people to seek the protection of the Angel for themselves and their families. Such a tattoo usually represents the dark side or sadness of the bearer. Ethereal Female Angel – In the Western culture, angels are usually pictured as beautiful and pious females, dressed in pure white flowing clothes. The popular belief implies that someone is watching over the bearer and guarding him with magical powers. It also keeps reminding the bearer to follow the path of righteousness and spirituality, which will earn him a place in the heaven after the end of life on the earth. Fallen Angel Art – The fallen angels represent the dark angels, who have fallen out of favor of God because they have some something wrong. They have followed the path of the right earlier, but because of some reason, they have decided to change their ways, which have made them fallen angels. These tattoos are often pictured in darker shades to represent their negativity. They are also shown to bear a menacing look, with horns or torn wings to complete the effect. Satan, Beelzebub and Leviathan are some of the well known fallen angels. 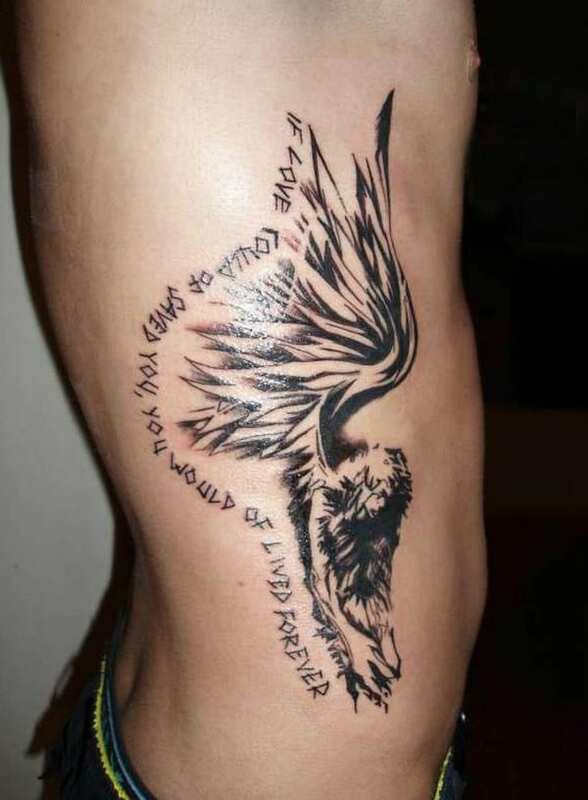 Angel Wing Designs – Some people prefer to have simple angel wings designed as a tattoo, rather than having the whole angel engraved on themselves. 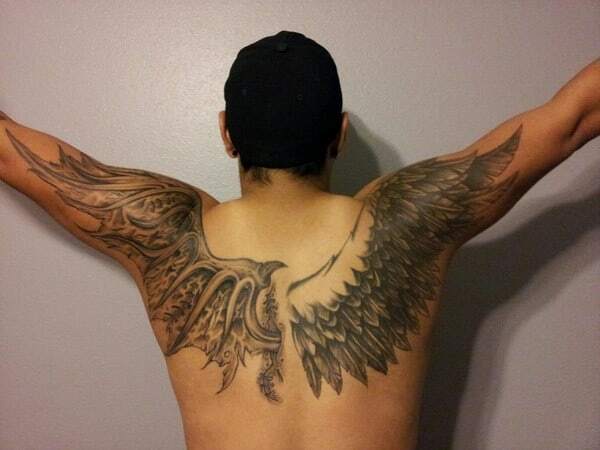 An ideal place to have large and ornate wings pictured is the back and the shoulders, right between the shoulders as if the wings are actually growing from there. 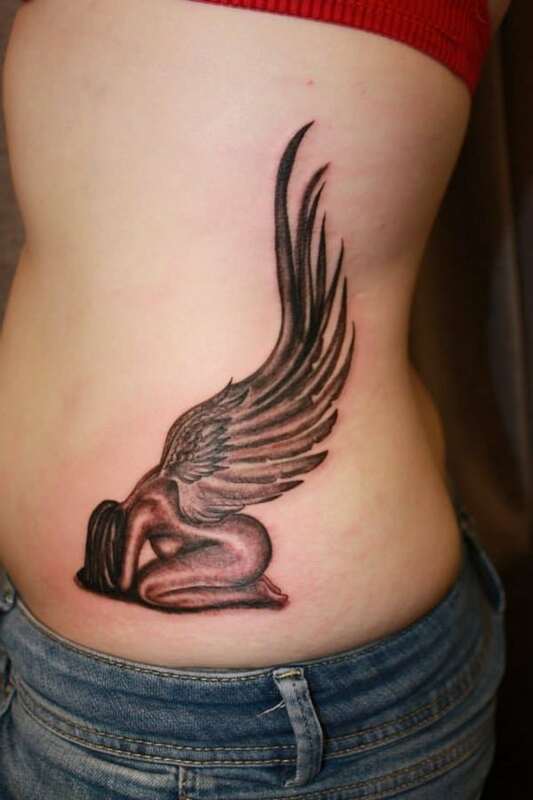 A smaller sized pair of wings can be featured on the lower back. 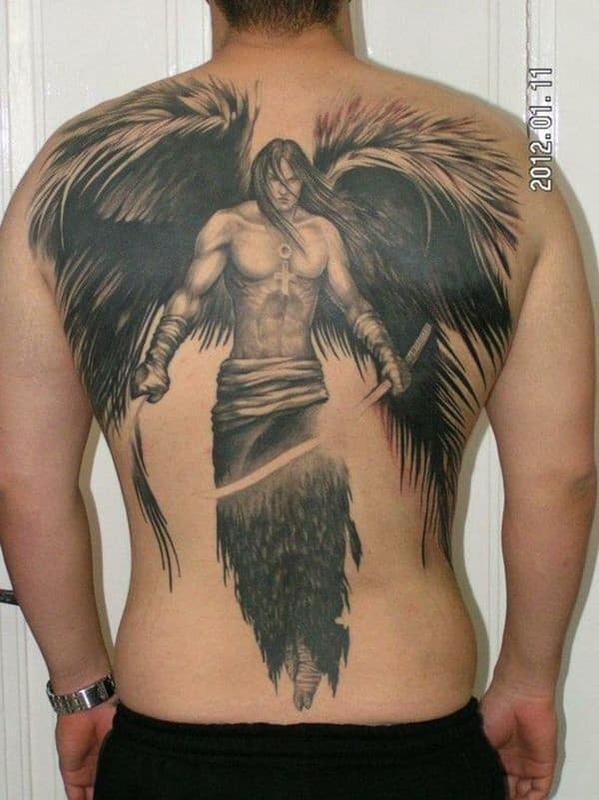 This is one of the most desirable angel tattoo design. These wings can be featured in black or can be made using vibrant colors, depending upon the choice and personality of the bearer. Though wings have been associated with closely, the Bible has not mentioned angels to bear wings, rather it is the cherubs which feature them as a part of their bodies. Melanie Martinez – She is a 21-year-old American woman who became very famous in the world of music. She is into singing and song writing. 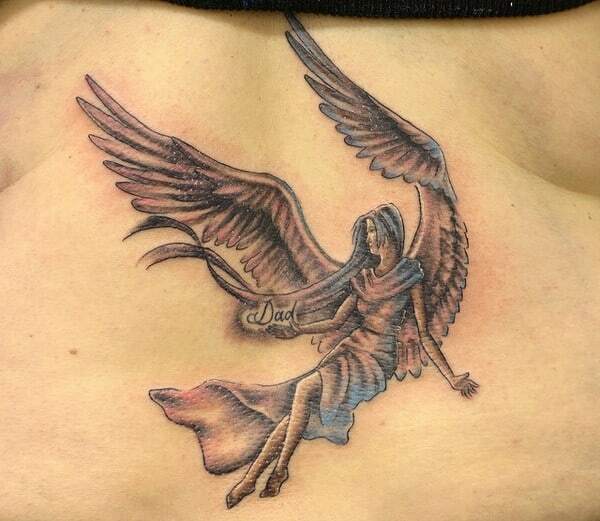 Moreover, Melanie looks even more gorgeous with her angel art that is located on her ankle. The design is very simple that consists head of an angel that has a retro pin-up style. Katrina Jackson – Katrina Jackson is a name that is very popular in the United States. She is currently a dignified lawyer. Who says lawyers do not wear tattoos? Well, Katrina is an exception for sure. 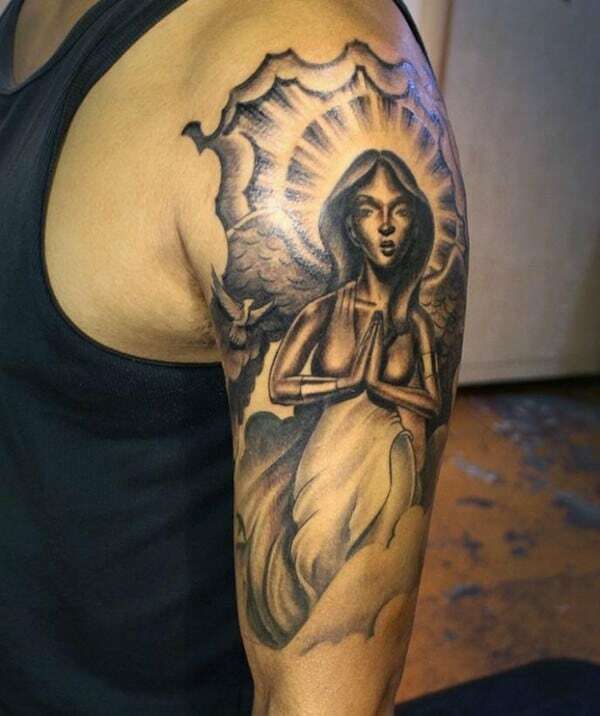 She looks very beautiful with her angel art tattoo that is located on her upper right arm. The design is an image of an angel that is surrounded with some other sub designs namely black and red roses. Alyssa Milano – She is a 43-year-old American woman who became extremely famous in the world of acting. Aside from being a high caliber actress, she is also a singer and movie producer. She only has a small angel art tattoo located right there on her ankle, but it certainly looks very gorgeous on her. Pink – Pink, or Alecia Beth Moore in real life situation, is a 36-year-old American singer and songwriter. She is also a great fan of an angel art. 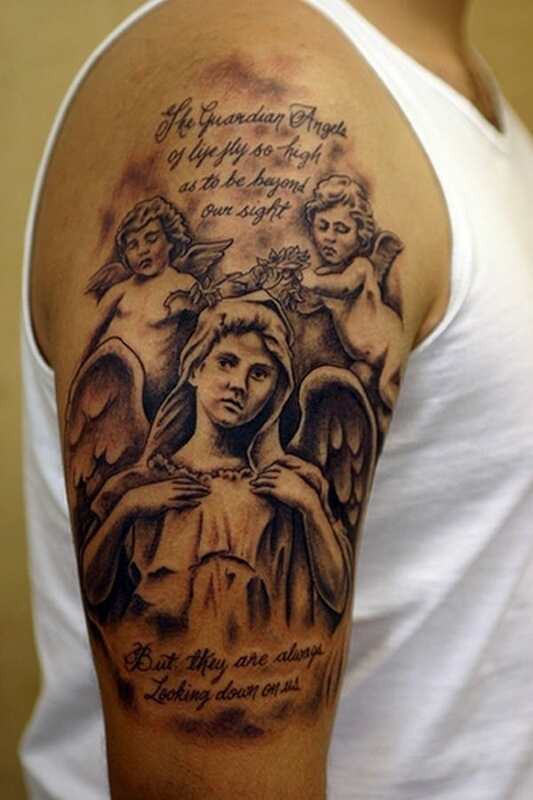 She has a very beautiful angel art inked located right there on her left shoulder blade. The design is composed of an angel who is trying to reach a shooting star. 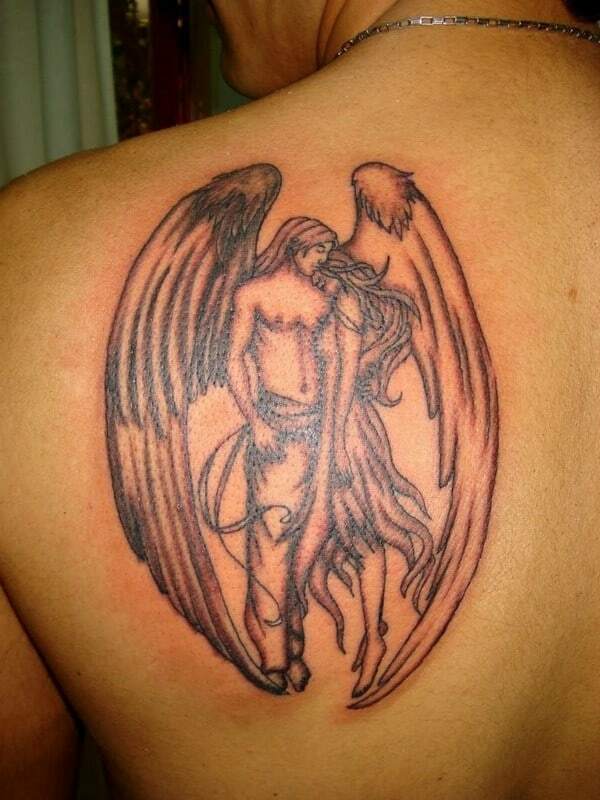 Angel tattoos are very beautiful arts that can be engraved on your body. There is no way they will not look great on you since angels are known to be creatures who have a considerable amount of goodness within their hearts. Aside from being gorgeous tattoos, these tattoos are also very meaningful.